A fun read. Silly, but fun. With a well-received dash of humor. An urban fantasy about a druid allied to a pack of werewolves and a vampire battling the denizens of the spirit world (mostly Irish) with the hindrance and help from various witches . . . in contemporary Arizona. Yawn, it’s been done, right? Not so fast, what sets this urban fantasy apart is the storytelling. The POV character is a 2100 year old druid, who has the perspective and insight to see both the dangers but also the humor in his situation. Reading this book I recognized that I look for–even expect–humor in literature if I’m to enjoy it. Great stories have the depth to contain either comic relief (Shakespeare and Tolkien) or, even better, a storyteller who sees the incongruous and funny along with the threatening and noble. It variegates the mix and adds to the pleasure. Normally, I avoid urban fantasy. Most of it IMHO is stupid. This is well done. A good read. 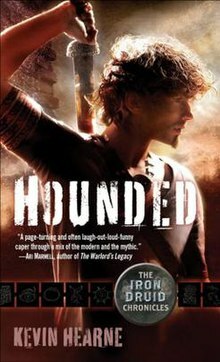 This entry was posted in Book, Reviews and tagged druid, Hounded, humor, Irish, Kevin Hearne, mythology, Shakespeare, Tolkien, urban fantasy, werewolf, witch by andreart2013. Bookmark the permalink. If I were more into werewolves and vampires and druids I’d read this. I read the series about Merlin years ago, a few years ago I bought it again and read it again. Vampires are okay – on HBO I watched Breaking Dawn 1, 2 whatever. It was okay and the werewolves were cooler than the vampires. But I loved what Stephen King said: the series wasn’t about vampires or werewolves, rather about a woman trying to control two bad boys- one a vampire and one a werewolf. Of course both dudes were into her. This made me laugh. I’m not into werewolves and vampires as a rule. I could, but won’t, write a length why I dislike urban fantasy. Normally, I wouldn’t even have read this book.